It has been a while since our last newsletter. Thanks for your patience! This is the minimal summary of what aponix has done in 2018. Our focus has been to improve our parts and extend the production of materials and our direct sales including logistics and exporting capabilities. We are also coming closer to finding and binding dedicated distribution partners that can add their services and expertise to sell our products to their customers. And of course we have been busy showing and promoting the aponix vertical barrel at tradeshows and events. Get the video version of the update, learn about the aponix ‘why’ and see some interesting barrel versions in Marco’s talk at this year’s Seeds&Chips conference in Milan. Duration: 15min, starting at 38:17 of the overall session on ‘Controlled Environments, Future of Indoor & Vertical Farming’. We rearranged our page, explaining the irrigation options more clearly: There are quite a few options to ensure irrigation of the barrels for soilless use – multiple barrel or standalone operations. Once the liquid attaches to the inside surface gravity will do the rest for you. Explained in more detail on this new page. This is a reverse compatible change to our major ring segment piece holding two net pots. If there was too much liquid running on the inside, some of it could have been pushed to the outside in the past. We closed these gaps now by changing our series tooling. 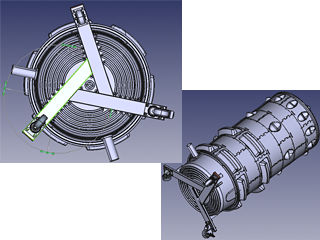 The new manual page now shows the basic assembly and disassembly in more detail with the current building blocks. We have also updated the manuals. We had to remove the prices from our website this year. Interest is coming from end users, resellers and potential project partners globally and the published pricing details created too much confusion. For price details please use our shop pages to collect a parts list that you are interested in and request an individual quote including shipping on the checkout. In the meantime we have set up a more consistent pricing strategy and a more reliable production with a higher stock. We also decided that a one-time set of testing materials up to 4 barrel setups can be shipped for the reseller price to businesses direct from aponix Germany. 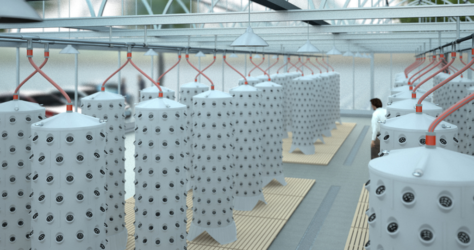 On average the cost for one grow space is around 4 and 6EURs (depending on the setup), which is well below any other solution out there especially if you also consider the quality and usability of our solution. We also changed the packaging for shipping. The standalone version with the closed base is now being shipped in a more compact 70x70x45cm box, which reduced shipping cost and made it possible to ship with standard carriers. 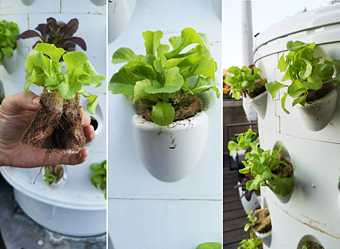 Images from a growing test without plastic net pots and rockwool just in foldable jute sheets from HollandPlug growing lettuce, mustard greens and basil in a small standalone vertical barrel setup on a terrace. There are partnering research facilities working on alternative net pot-substrate replacements too. 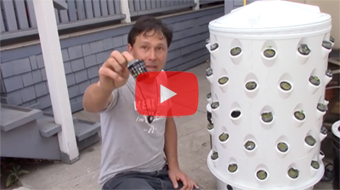 Kevin from Epic Gardening testing and reviewing a small setup of our vertical standalone barrel – ‘Vertical Hydroponics: Awesome Modular Barrel System!‘, 17min. Really cool to watch him explain the steps you need to take to set up and run one of our systems. 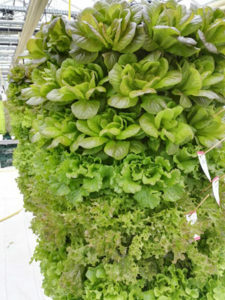 After visiting Kevin’s place one of our favorite gardening youtubers John Kohler from growingyourgreens.com also did a short review of the system vertical barrel. The video covers the whole tour, the aponix section starts at 18:22. Impressions from aponix trade shows and conferences. Past events and media presence can also be found in our news section and on our Facebook page. 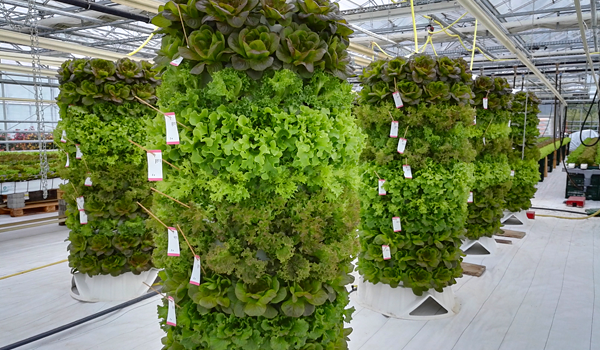 The mission of aponix is to make hyperlocal edible plant production easy, productive and robust – for commercial operations running urban farms and for the advanced prosumer or hobby enthusiast. The aponix parts can be used to set up grow spaces for both types of applications in very flexible and modular ways. Remember: Height = number of grow spaces = always variable. No fixed elements (tables or racks) needed. Today aponix needs your support! 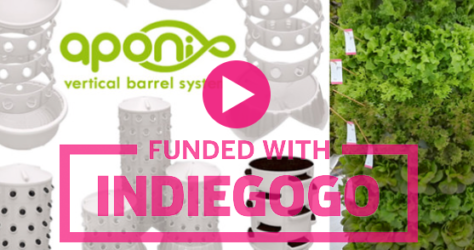 Please check out our crowdfunding campaign on Indiegogo. You will find new details about the vertical barrel concept – peek into manufacturing, hear why we are doing all this (see video) and learn how it all began. 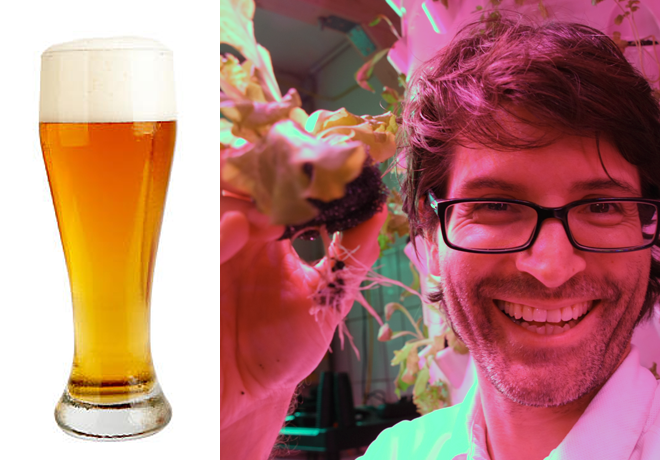 Mission of aponix is to make hyperlocal edible plant production easy and productive – for commercial operations running urban micro-farms (B2B) but also for the prosumer or hobby enthusiast (B2C). The aponix parts can be used to set up grow spaces for both types of applications in very flexible and modular ways. Missing: A rolling metal triangle for the standalone barrels. Substrate based barrels can become heavy. Also the soilless standalone barrel still needs a good solution to move it around. If you look closely, the bottom of the closed base already has some placeholders for a triangle metal structure. It is a simple welded 3-piece structure that we can equip with rolls. Missing: The metal base for rotation of the multi barrel setup. The idea here is to use the top lid upside down. It already can be used as base for the hanging barrel. We need to have sort of a christmas tree metal base that can hold such a turned lid and provide a bearing underneath and at the same time let the liquid drain. This would also make up the base for future automation and (auto-)rotation and solve lighting issues. There are many more ideas for extensions. With your support we will realize as many of them as possible. If you are inspired by the design and have ideas for a useful extension you like to use yourself or share with us, we are happy to hear them. Do you know the concept of a ‘suspended coffee’? It is when you go to a bar and pay for 2 coffee, drink one and the spare one can be picked later by someone that can not afford it. This is the same for the barrel parts! Your contribution helps give a school or institution that could otherwise not afford the parts access to the latest hyperlocal growing equipment for education or self-sustainability. 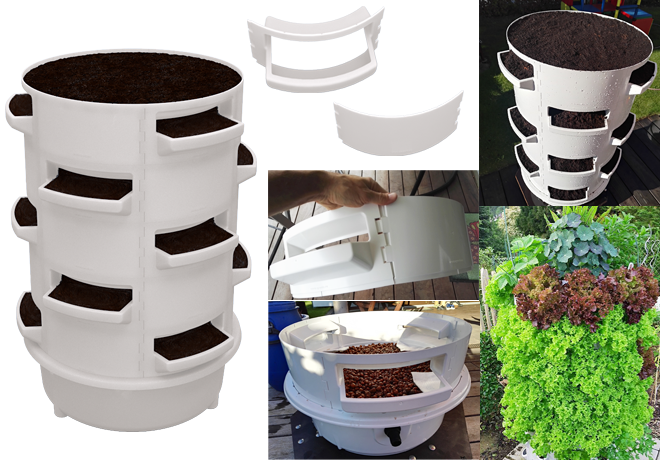 Provides an integrated reservoir in the base, 10 plantable ring segments, assembled using 60 of our 1/6th parts each providing two 2-inch net pot inserts (120 in total), a top water buffer and a top lid. You will need a simple 20-30W submergible pump and a 3/4″ hose to operate it. Get more info in our website about this bundle. As a raised bed alternative the vertical barrel can also be filled with substrate (soil or other medium). Or it can be used for your pond as bio filter. In this case the 1/6 parts for ring segment assembly come with 18 shelf parts and 18 closed parts. The closed base provides a wicking tank for irrigation. Get more info on our website about this bundle. using 72 of our 1/6th parts each providing two 2-inch net pot inserts. The top lid comes with a sprinkler for irrigation. Get more info on our website about this bundle. This is an experimental perk in our campaign. Get it and Marco owes you a drink. Thanks! Looking forward to post the pictures on Facebook! Prost! 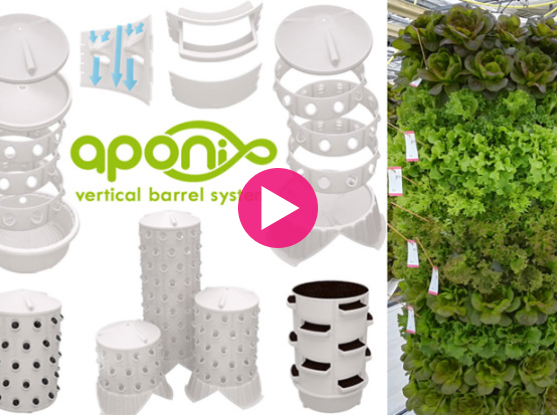 The aponix vertical barrel enables you to set up vertical grow spaces in a very flexible and modular way. By chosing from a range of different parts you can assemble ring segments and stack them into a vertical cylinder or barrel (diameter 57 centimeters). Cultivation area is the surface of the cylinder and it can provide differently sized grow spaces for your crops. Irrigation is done from one entry point at the top either by using a standard inverted sprinkler, an aeroponic spray nozzle or our own irrigation buffer that can be operated by a simple pump. You can use it as a single barrel with the base being the reservoir or arrange multiple barrels in a production line using a central nutrient reservoir. The system works just the same as a normal NFT but in 3D. 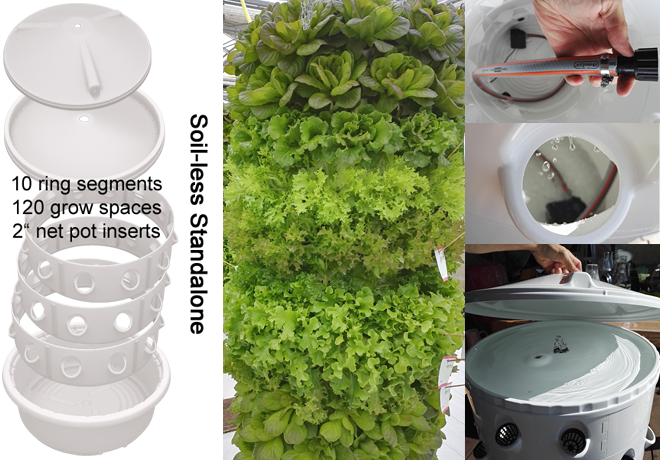 This is how the de-facto standard in soilless edible plant production looks like: It is done on a horizontal plane in 2D using up a lot of space. Most vertical systems use racks or multiple layers to stack production – introducing new challenges. The aponix vertical barrel translates the horizontal cultivation area to the surface of cylinders. A lot of thought and iterative improvement has gone into the parts and the design to make the vertical barrel easy to use and handle in your day to day production. This is how it looks when it is ready for harvest! Your cultivation area is defined by the number, the position of the cylinders, their hight and surface configuration. 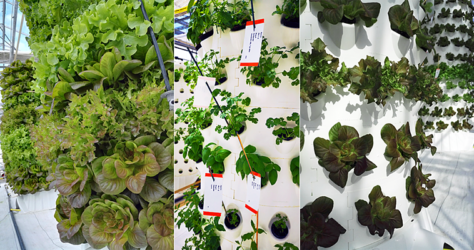 Get creative to figure our your individual setup for your urban micro-farm plot! Check out our integration examples. Don’t hesitate to ask for help! You like to schedule an appointment / get a ticket / invite for one of these shows? Please contact us. Past events and media presence can be found in our news section and on our Facebook page. 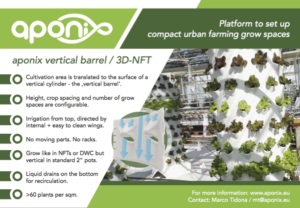 If you like to get an insight into the latest results of the soilless research here in Heidelberg/Germany including 2 NFT solutions and our vertical barrels, please let us know. Support aponix! Extend the system! If you are professional commercial grower planning to operate a larger facility with multiple soilless barrels and centralized reservoir, you will set up quite a bunch of these. Regardless how high ring segments are stacked, irrigation will always be from the top. You can find integration setups on our website showing how you can arrange your cultivation area. Of course there are already other tower solutions. In the end the product should be of the highest possible quality and be maintainable, easy to handle and provide a maximum number of grow spaces. We have dedicated a whole page to usability and quality. Remember: Each 15cm of height can add 12 more grow spaces for seedlings pregrown in 2-inch net pots. In this case you will need an additional submergible pump to push the liquid from the base to the irrigation buffer on the top. 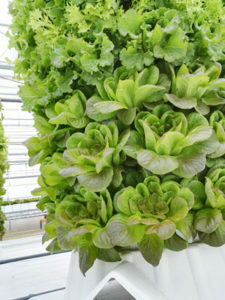 The most simple and pragmatic way for prosumers (end-consumers) to grow their own food is to use substrate or soil (http://www.aponix.eu/vertical-barrel-soil-based/) . In this case the barrel setup provides a simple raised bed alternative with a minimal footprint. Ring segments are assembled alternating with a closed part (http://www.aponix.eu/shop/closed-part/) and a shelf part (http://www.aponix.eu/shop/shelf-part/) . 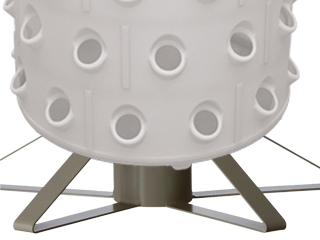 The base serves as a tank and has an overflow valve to prevent over watering. The new shelf part provides a large opening that can be worked on with a garden shovel for substrate based setups. It can be arranged with the closed part to configure more vertical space for your plants. 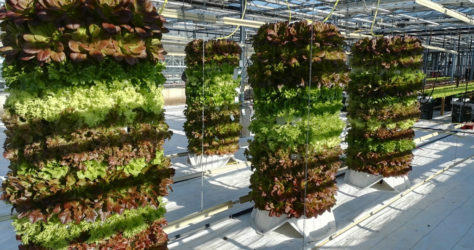 A closed part can be used to add horizontal or vertical space for plants for soilless or substrate based applications. It even serves as a base for the next part. Sometimes it can be handy, if you could just reach inside a planted or running soilless barrel to clear out something or reach for your submerged pump. Here is a part with a revision opening. For soilless irrigation so far you needed a strong pump. With this new part you can connect a simple small pump to the black valve. The top irrigation buffer is filled with liquid. An overflow hole prevents over watering. A closed standing base serves a) as reservoir for the standalone soilless setup, b) as tank for the wicking bed in the substrate based setup, and c) as a general base for grey water filtering.Stay tuned for more extensions!Aponix already has some more very useful parts in the pipeline. If you happen to have another idea yourself, be it a specialized growing adapter for a certain crop or a completely new application – please let us know or contact us via Facebook. Aponix is still looking for resellers and distribution partners! With the new parts ready to ship and the extended versatility we are at the ideal point in our development, where we need outside partners to help us set up global sales. If you like to learn more about that, please click here. Weltkongress Gebäudegrün DESIGNING WITH NATURE (WGIC) June 2017, Berlin. We are also currently looking into possibilities to exchange the raw material from plastics to ceramics in order to be able to integrate the vertical barrel directly into buildings and architecture. Meet us in September 2017 at AgTech Week NYC and at the AVF Summit in Washington. 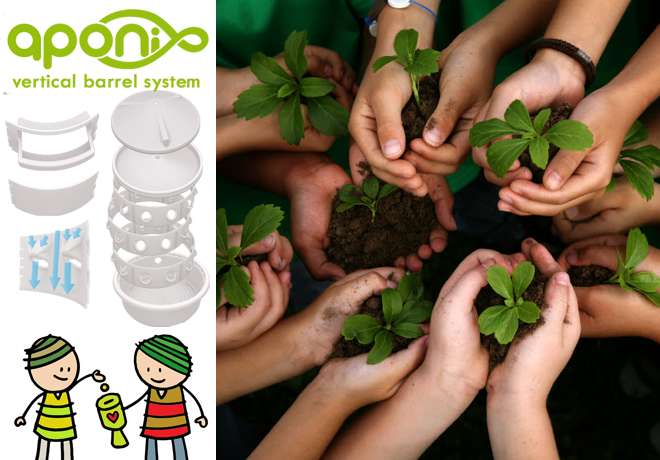 The series production for new parts extending the vertical barrel concept into a soil-/subtrate-based variant and also a standalone soil-less barrel are on the way! All new parts will be available in late Summer 2017 and can already be pre-ordered from our website’s order area. A shelf part used to add grow space for the substrate based setup. The closed part also extends the soil-less version. For larger crops as spacer on the cultivation area or barrel surface. The closed standing base can also serve as a reservoir for a standalone soil-less barrel >100 grow spaces. Another missing part is the low tech water buffer for the irrigation of the soil-less version. 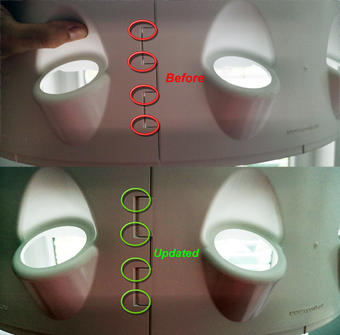 It will be placed under the top lid to hold ~8 liters of water to gradually irrigate the inside. This part will be used in the future standalone soil-less version or if the irrigation using the standard sprinkler is not an option in larger low-tech setups. Click here to see how a soil-based setup will look like. Since April 2017 we are an EIT Climate-KIC Startup for ‘Urban Transitions’. We are proud to receive substantial support, shaping the aponix story and mentorship, extending into soil-based hyperlocal equipment and also receive additional financial support that way.Thanks Climate-KIC! 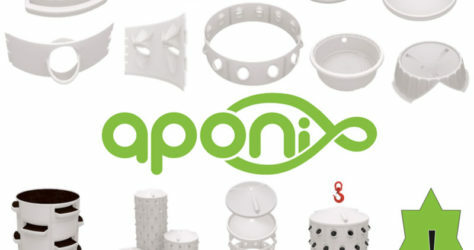 Aponix is looking for resellers and distribution partners! After 3 years of development and setting up the first series production in Germany, manufacturing and shipping the first parts for our soil-less barrels, we are at the ideal point in the development where we need more mature outside partners to help us set up strong global distribution channels. The Garden and Greenhouse Magazine wrote a product review about our soil-less vertical barrel. 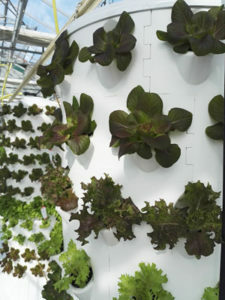 Hortidaily wrote an article about the vertical barrel system. There has also been a Spanish version on Freshplaza. A general English article about the aponix vertical system including an image download. The announcement of the soil-based version in German including an image download. If you like to write about aponix please let us know if you need additional content, materials or an interview partner! It has long been overdue that aponix points out the key differences between our equipment and philosophy and the various other ‘tower’ solutions out there. If you still think aponix is just another hobby tower system __please__ check out our page on quality and usability with regard to operations and materials used. 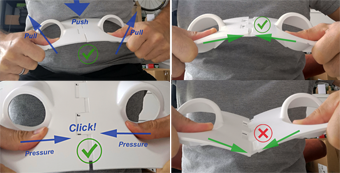 Aponix has put a serious amount of effort into its design regarding many different dimensions of the product to make it as simple and robust as possible. Aponix will be present at the AVF Summit on June 12 in Amsterdam. 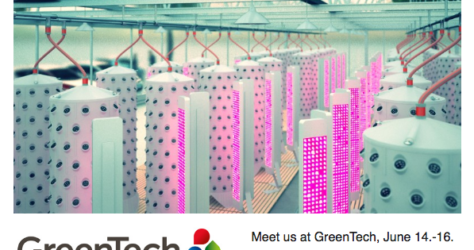 Aponix will be exhibiting at GreenTech, June 14.-16. 2016 in Amsterdam. You can find us in the Vertical Farming Pavilion at booth no 08.410Q. 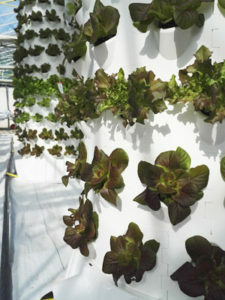 Aponix aeroponic barrels are shown as a kind of new component for vertical farming in the Beijing International Urban Agricultural S&T Park in Tongzhou. 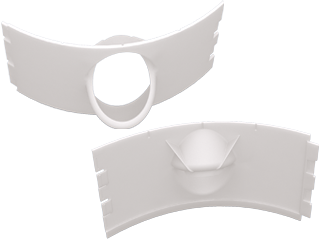 New version 2.0 of our 1/6 part has been announced – new zip-click connection and new internal wing structure to be used as vertical NFT. PCT announcement of our German patent has been issued, German patent has been granted and published. Marco’s interview with Avinash Burra from Green Millenium. The independent governmental horticulture research facility ‘Staatliche Lehr- und Versuchsanstalt für Gartenbau (LVG) Heidelberg‘ starts officiall test of our barrels.